The 4A-GE is a 1600cc straight 4 engine, produced by Toyota between 1983 and 1998. After it's introduction in May 1983, this engine gained quite a bit of fame with Toyota and tuning enthusiasts. Main reasons for it's popularity were it's reliability and good performance in it's class. And it proved to be a very nice tuning object where, although the basic design was very good, a lot could still be gained and the engine got a lot of aftermarket support from renowned tuning brands. The basic design of the engine was simple, light and compact and it even saw action in several race classes, proving the potential and quality of this little sports engine. It was mostly installed in Toyota's lighter sports cars like the Celica, MR2 and Corolla GTi's and is thus well known with Toyota drivers all around the world. Even now, 30 years after it's introduction, and even though Toyota has stopped making them decades ago, it is still popular with Toyota fans. But an engine can't be in production for over 16 years without undergoing some changes to keep the engine up-to-date. But because the engine has undergone some changes over the years, we can also distinguish different generations of the same engine. But some of the changes can't been seen on the outside or are very subtle, so it is sometimes confusing which engine is which generation. The official designations that were sometimes used for the engines like 4A-GEU of 4A-GELU only adds to the confusion. Mechanically they remain the same engine, they are after all 4A-GE engines. But these designations are used to indicate which market these engines were destined for or how the engine was mounted in the car. For instance, the 4A-GEU is the engine that was used for the Japanese and European markets and the 4A-GEC was the engine for the American/Californian market with its strict emission standards and the 4A-GELU is the engine that was mounted transversely in the cars. It had a different designation because inlet-and-outlet manifolds were different to the 4A-GE's that were mounted lengthwise into the car (like in the AE86). But you will not find these designations anywhere in the car or on the engine. So to keep things simple and because for the engine itself, it doesn't make that much of a difference I will keep referring to these engines as just 4A-GE. I have experienced first hand how much information is on the world wide web about the 4A-GE, and also how much of that information proved to be wrong later on. As said, there is much confusion about the specifications of the different generation of these engines. I think I now have a pretty good idea on how these engines evolved and would like to try and eliminate some of the confusion about the different generations of the 4A-GE engines and the specifications. 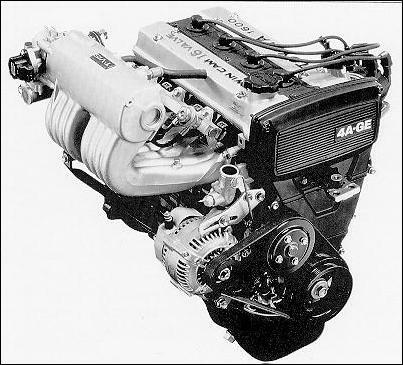 After the 4A-GE engine was developed in collaboration with Yamaha (who designed the cylinder head) as the successor to Toyota's sporty 2T-G engine, the engine was first introduced in the famous RWD Corolla AE86. The engine was received very well and the 4A-GE went on to power the first generation of the MR2 (AW11), the first Celica's and FWD Corolla's (E80 series). Because of different grades of petrol and environmental legislation in different markets around the world, the exact specifications for the very same engines can vary. So the specifications listed below will be those of my European home market. +/- 120 hp @ 7000 rpm. 141 Nm @ 6000 rpm. Toyota has made some changes to the 4A-GE engine somewhere in 1986. Part of the reason for these changes were to beef up the engine a little for future modifications and even better reliability. New cylinder blocks were cast with additional strengthening, which was achieved by adding 4 extra ribs, bringing the grand total to 7 ribs in the cylinder block. The connecting rods were also beefed up, the piston pins were now 20mm and the big ends were enlarged to 42mm to help cope with higher power outputs. Somewhere in the late '80's Toyota looked at the cylinder head design again and made some changes to further improve performance of the 4A-GE engine. The biggest changes were made to the intake of the engine. Where the first two generations of the engine needed the T-VIS system to make torque at low RPM's, the new head and intake manifold were redesigned with smaller inlet ports to improve airspeed etc. (hence the name 'Small-port'). Compression was upped a little, larger injectors were used, the camshafts were altered and oil squirters were added to improve piston cooling. This was also the last generation that featured the 16 Valve cylinder head. +/- 130 hp @ 7000 rpm. After this 3rd generation Toyota did continue to further develop the 4A-GE engine, but the changes to those engines were so big that I gave them their own Tech pages. These engines are known within Toyota circles as the Silvertop and Blacktop.